Considered the world’s most famous waterfalls and located on the border of US and Canada, the Niagara Falls recently upgraded the existing Xenon illumination as part of the Niagara Falls Illumination Enhancement Project utilising two Philips Strand Lighting NEO consoles – used widely in theatrical lighting – to control 1,400 third-party colour LED luminaires. Grouped in 350 controllable zones, the luminaires enable lighting effects such as sunrise, sunset and the Aurora Borealis, to be played on the water cascading over the falls every second. 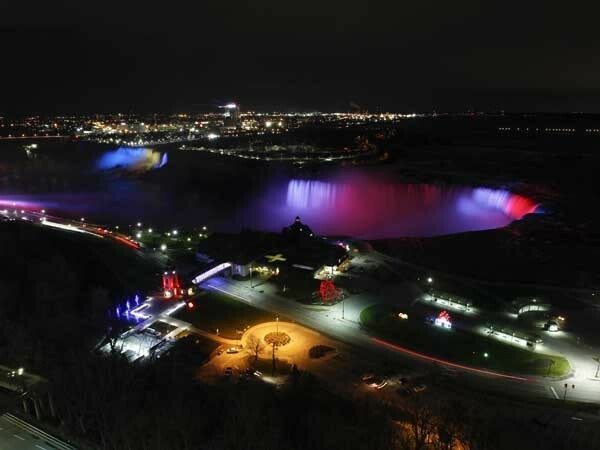 A key objective of the Niagara Falls Illumination Board was to enhance the visitor experience as well as gain energy efficiencies and longevity from the LED lighting. The $4-million upgrade of the previous Xenon lighting system will provide a 60% energy saving while the crisp, clear illumination will be up to 4-14 times brighter than the original system based on which of the 18,000 available colours are being projected. The LED lighting project was implemented by a consortium of companies comprising of ECCO Electric Ltd, Salex Inc., Mulvey & Banani Lighting Inc., Sceneworks and Stanley Electric. Describing the project as challenging and ambitious, Colin Kavanagh, General Manager of Philips Entertainment Lighting said the beautiful night-time spectacle underlined the dependability and flexibility of their lighting control systems and software to do more than just stage shows and concerts. Elaborating on their choice of Philips Strand Lighting NEO consoles, Alan McIntosh, Senior Lighting Designer at Mulvey & Banani Lighting said they knew at the outset they would need a robust theatrical lighting controller with an effects engine capable of producing the natural, fluid moments. Ron Foley of Sceneworks, who recommended the Philips Strand Lighting NEO consoles, said they were confident about the suitability of the NEO for the unique requirements of this monumental project. Key requirements included individual DMX control of the fixtures and a simple touch screen operator interface to allow volunteer operators to manage the display without the need to train on the console. Philips Entertainment Lighting designed custom software features to further improve the efficiency and the ease of programming of the NEO console.